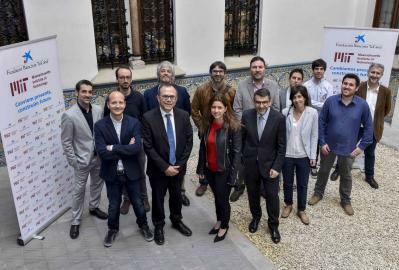 Dr. Pol Forn-Díaz from the QUANTIC team participated in the press release of the MIT-La Caixa Seed Fund project at the beautiful Palau Macaya in Barcelona. The project titled ‘Multi-Qubit Couplings in Superconducting Quantum Circuits’ involved a collaboration with Prof. W. D. Oliver at MIT. The event was led by Àngel Font (La Caixa), Mercè Balcells (MIT, IQS and one of the instigators of this seed fund), and awardees Josep Samitier (director of IBEC) and Alexandra Muñoz Bonilla (IMDEA). The fund has awarded a total of 12 projects out of the 30 which were evaluated. BSC obtained two awarded projects. See the BSC press release for more information. The news was picked up by the media. You can read the news on the official La Caixa foundation site (in Spanish/Catalan), newspapers Ara (Catalan), La Vanguardia (Spanish), El País (Spanish), El Mundo (Spanish).